The Nobel Prize in Physiology or Medicine has rewarded a wealth of achievements, each of which helped to reveal secrets behind the complex biological systems that protect us against disease. The human body is constantly engaged in a bitter internal war against vast armies of microscopic enemies. Pathogens – be they bacteria, parasites, fungi or viruses – will seek any means possible to broach our bodies’ defences; they will enter through wounds, or through the mouth as we swallow, or even when we breathe in. Once inside our bodies, they do their utmost to grow and multiply – with destructive consequences. By damaging our cells or releasing their poisons, these pathogens cause a host of illnesses, from common colds and measles to potentially fatal conditions like tuberculosis and malaria. Thankfully for us, we are equipped with an internal defence mechanism designed to combat these threats: the immune system. This extraordinarily sophisticated set up enlists the help of a complex network of organs, tissues and cells. However, its purpose is remarkably simple: to recognize, disable and dispose of all intruders – and then to remember them, in case they return at a later date. In order to perform this astonishing feat, the immune system has armed itself with more than one method of attack. Some components of the immune system will engulf and destroy all and any pathogens indiscriminately. Other components produce specialized proteins designed to wipe out specific foreign organisms, or their poisonous products, with pinpoint accuracy. Understanding the workings of such a complicated defence system owes much to the ingenuity of a long list of scientists, and a series of breakthroughs that took place over many decades. Given how significant these discoveries have been to human health, a number of these crucial breakthroughs were rewarded with Nobel Prizes. Thanks to the efforts of many Nobel Laureates (not to mention their colleagues and other scientists), we now have a good understanding of how the immune system senses that an attack is underway, and its various methods for recognizing, and dealing with, these intruders. We know how the immune system avoids destroying the body's own cells and tissues – but also how it can, on unfortunate occasions, malfunction and unleash its deadly forces upon the very body that it is designed to protect. White blood cells play a key role in the immune system's remarkable protection mechanism. They are produced in bone marrow, and are transported in the blood stream to specialized organs like the thymus and spleen, where they develop and lie ready to be launched against infections. Different types of white blood cells have different roles. Macrophages engulf and destroy bacteria and damaged cells in a process called phagocytosis. 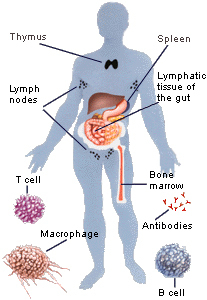 B cells, or B lymphocytes, produce antibodies, which can neutralize bacteria or their toxic products, and viruses. T cells, or T lymphocytes, can track down viruses that have invaded cells. Our story begins in the mid-19th century, at the start of a scientific and medical revolution. For centuries, people had held many weird and wonderful ideas about how illnesses were caused. Two hundred years ago, people thought diseases sprang from thin air, or from the toxic vapours or 'miasmas' (from the ancient Greek, meaning "pollution") given off by decomposing organic matter. However, a series of pioneering experiments from the mid-1800s onwards, carried out by the French microbiologist Louis Pasteur and later by the German physician Robert Koch, revealed the truth. These two scientists showed that diseases are, in fact, caused by the presence of specific microorganisms that invade, and then multiply within, the body. Their discoveries followed British scientist Edward Jenner’s famous smallpox experiment of the late-1700s. Jenner had heard tales that dairymaids suffering from one disease, cowpox, were somehow protected against another, much more deadly disease, smallpox. If the tales were true, Jenner wondered whether it might be possible to transmit this protection from one person to another. In 1796, he chanced upon a young dairymaid called Sarah Nelms who had cowpox-related sores on her hands and arms. Jenner extracted pus from her lesions, and then smeared it into the wounds of a healthy 8-year-old boy called James Phipps. The poor boy fell ill with cowpox, but after he recovered Jenner carried out an even more risky experiment. Jenner rubbed material into his wounds again, but this time it was the dangerous smallpox virus. To Jenner's great relief, nothing happened to boy, he had become immune to smallpox. Jenner called this rather gruesome procedure a vaccine, from the Latin word vacca (cow). And despite the long list of vaccines that have since been created to prevent illnesses, smallpox remains the only known human infectious disease to have been successfully eradicated in this manner. Yet at the time, Jenner was widely criticized and ridiculed for his idea. One cartoon from 1802 depicted people who had been vaccinated sprouting cows from different parts their bodies. Pasteur thought differently, however. He believed that if a vaccine could be found for smallpox, then it should be possible to get rid of other diseases by creating a vaccine. In the 1880s, he successfully showed that injecting a weakened form of the cholera bacteria into chickens prevented them from dying of the disease. This resistance to disease was given the name immunity, from the Latin word immunitas, which referred to the special status of protection or exemption from taxes granted to soldiers by Roman Emperors. The possibility of treating and preventing illnesses had been transformed by Jenner's, Pasteur's and Koch's discoveries. However, despite these incredible advances, nobody yet knew what was triggering this immunity, or why or how immunity occurred. The first attempts to understand the immune system’s main defence mechanisms spawned two pioneering, but opposing, theories, which provoked a long and bitter dispute between the camps led by Koch and Pasteur. As the conflict raged on the chief protagonists of this ongoing dispute, Ilya Mechnikov and Paul Ehrlich, somewhat remarkably became co-recipients of the 1908 Nobel Prize in Medicine. The Russian zoologist Ilya Mechnikov was, by all accounts, a complex and contradictory man; he was highly energetic (his childhood nickname was "Quicksilver"), and also volatile and prone to suicidal thoughts, but he was a gifted investigator, and capable of moments of uniquely brilliant insight. One such moment came in the 1880s, while he was summering on the Italian coast. Mechnikov was fascinated by the way that cells in simple marine organisms absorb and digest nutrients. Gazing under the microscope at a group of moving cells inside starfish larvae, he was gripped by the notion that these wandering cells could also defend the organism from intruders. Seizing a piece of a rose-thorn and pushing it into the larvae, Mechnikov saw that a pack of mobile cells surrounded the thorn, like flies around honey. Before his eyes, they appeared to swallow up, and eventually dispose of, the offending object. 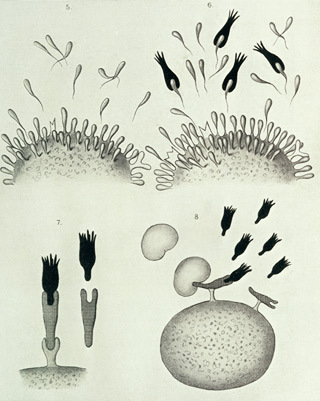 Mechnikov conceived a radical concept for what these devouring cells, which he called phagocytes, were doing. (The name comes from the Greek phagein, meaning "to devour", and "-cyte", the suffix in biology denoting "cell".) He suggested that phagocytes were an organism's primary line of defence, and that their assigned task was to engulf and digest any foreign agent they encountered. If you've ever had a cut or splinter and seen the horrid pus that forms around it, you have just witnessed phagocytes in action – pus is essentially dead white blood cells and other cellular debris, left behind after your phagocytes have done their job. 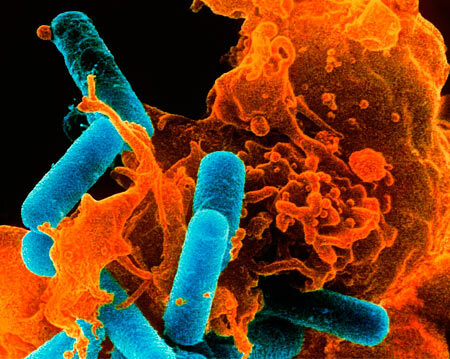 Coloured scanning electron micrograph of a white blood cell (orange) caught in the act of engulfing bacteria (blue rods). As Ilya Metchikov observed, wandering cells called phagocytes migrate to areas of tissue damage or infection to engulf and digest any harmful foreign particles, bacteria, and dead/dying cells. Credit: Dr Kari Lounatmaa / Science Photo Library.The photo was kindly provided by Dr Kari Lounatmaa / Science Photo Library. Mechnikov's theory was radical for two reasons. Firstly, many scientists had assumed that this type of inflammation response to a cut or splinter was a reflex reaction that served no benefit to the host. Secondly, and perhaps more importantly, other scientists were equally convinced that the active workings of the immune system did not take place within these cells, but rather within our blood. Chief among Mechnikov's critics was Koch’s assistant, Paul Ehrlich, a prolific and innovative scientist. Ehrlich developed techniques for staining tissues and bacteria with chemical dyes, and came up with the idea of creating 'magic bullets' – drugs that specifically seek out and destroy invading microbes or tumour cells. Ehrlich also smoked 25 strong cigars a day, and loved to sketch out his theories on the nearest available space – even if this was the laboratory floor, a restaurant tablecloth, or the front of his own shirt. But despite being an exceptional scientist, Ehrlich had been a terrible student who never did what his teachers told him to do. As Paul de Kruif wrote in his bestselling book of 1926, Microbe Hunters, when the young Ehrlich was asked to write an essay entitled "Life is a Dream" by his English teacher, he wrote: "Life rests on normal oxidations. Dreams are an activity of the brain, and the activities of the brain are only oxidations." Ehrlich also viewed cells in terms of being a mass of chemicals, and he imagined them to behave not unlike the chemical dyes he was so fond of studying. In his eyes, cells were surrounded by tiny spike-like molecular structures, or 'side-chains', as he called them, and that these were responsible for trapping nutrients and other chemicals, and for drawing them inside the cell. In 1897, he came up with a radical theory to describe how cells respond to a range of different threats. Ehrlich proposed that cells produce more of these side chains, which eventually break off, circulate in the blood stream and attach to toxic products released by bacteria. They attach to their target in a highly specific manner, like a key fits a lock, preventing the poisons from reaching their target in the host. What Ehrlich originally called side chains would eventually be known by another name: antibodies. These beautiful diagrams illustrating Paul Ehrlich's side-chain theory featured in his Croonian Lecture "On Immunity with Special Reference to Cell Life", which he gave to the Royal Society on 22 March 1900. His theory was later proved to be wrong, but his images left an indelible mark on researchers, inspiring them to investigate the true nature of these mysterious antibodies. Image kindly provided by Wellcome Library, London. For several years, Ehrlich's research group at the Institute for Infectious Diseases in Berlin and Mechnikov's scientists at the Pasteur Institute in Paris were involved in a war of words, each group hunting for evidence that would prove their own theory correct, and their opponent's wrong. In the end, both sides were right, because there are, in fact, two arms to the immune system. Mechnikov's phagocyte cells do indeed provide a first line of defence, or innate immunity; they devour invaders and clear up the debris from other immune-system battles. Ehrlich's side chains, or antibodies, form part of what is now known as acquired immunity, or the component of the immune system that learns and remembers how best to attack a particular invader. Ehrlich's idea that side-chain molecules are produced by all cells actually turned out to be wrong; they are in fact produced by a special kind of white blood cell (see 'Where Do Antibodies Come From?'). But his idea that antibodies provide a key that can recognize the 'locks' of different pathogen threats inspired many subsequent generations of scientists in the field. However, the fall-out from this dispute meant that decades passed before the full scope of the immune system was uncovered. Scientists – convinced that only one or other option could be correct – largely ignored Mechnikov's cell-based theory, in light of growing evidence in support of Ehrlich's antibody side-chains. Around this time, one of the most important pieces of evidence to support Ehrlich’s theory of antibodies came from another of Koch's assistants, who in fact received the first-ever Nobel Prize in Medicine, in 1901. Emil von Behring and his colleagues discovered in 1890 that animals, when injected with tiny, weakened doses of the bacteria that cause tetanus or diphtheria, produce chemicals in their blood that neutralize these microbes' disease-causing toxins. Not only that, but von Behring established that transferring blood containing these antitoxin chemicals to other animals granted them immunity from the same disease. As opposed to 'active' immunity, that is, the defence provided by a host’s immune system, receiving these antitoxins from another animal was said to provide 'passive immunity'. Taking this a stage further, von Behring showed that children injected with antitoxin-containing serum were cured of their diphtheria symptoms, and did not die of the disease. This was a hugely important discovery: the vaccines created by Jenner and Pasteur prevented diseases, but von Behring's discoveries showed how a disease that had already taken hold could be cured. Von Behring was hailed as a saviour of children and of soldiers, and the mass-produced form of his serum saved tens of thousands of lives every year in his native Germany alone. Unfortunately, this method of treatment – passive serum therapy – turned out to be useful for only a limited number of diseases. However, anyone who has ever received an anti-venom injection for snakebites has benefited directly from von Behring's discoveries. The achievements of von Behring, and of Metchnikov and Ehrlich, helped to establish a brand-new field of science called immunology, one that sought to explore the mysterious workings of the body's inner defence mechanisms. And once anti-toxins had provided convincing experimental proof for Ehrlich's antibodies, scientists rushed to investigate these toxin-neutralizing molecules in greater detail. In the 1900s Jules Bordet, a former student of Mechnikov's, carried out a set of experiments that revealed how antibodies need to recruit special allies in order to destroy specific bacteria. Bordet discovered that cholera bacteria met a violent death in guinea-pigs, involving holes being driven through their cell walls. But Bordet found that this grisly fate wasn’t sealed by antibodies alone, to do so they needed to partner up with a substance that is routinely present in the blood (a substance which eventually became known as 'complement'). We now know that complement is a highly complex group of several proteins that are always present in the bloodstream in an inactive form. When an antibody meets its specified target, this triggers a chain of events, in which each of a series of complement proteins is activated in turn. Waiting at the end of the domino line is a molecular cylinder, and when it receives the right signal, it forces itself through the walls of the cells surrounding the bacteria in question, tearing a series of holes that will eventually kill off the intruder. Bordet received the 1919 Nobel Prize in Physiology or Medicine for discovering complement, and also for designing a test that used complement to detect the presence of specific antibodies, or foreign agents specific to a particular disease. Known as the 'complement-fixation test', this diagnostic tool is still used in hospitals today. Where do antibodies come from? If antibodies can suddenly appear in the blood as and when they are needed, something must be creating and releasing them. Scientists refer to any molecule that triggers an immune response as an 'antigen' (from the term 'antibody-generator') – whether it belongs to a virus, a bacteria, or any other foreign material – and it was natural to think that the immune system custom-designs new antibodies whenever it encounters unfamiliar antigens. One person who thought differently, though, was the Danish scientist Nils Jerne – a brilliant thinker who had little interest in carrying out experiments. In 1955, he published his hypothesis – that at birth, the body has already created all the antibodies it is ever likely to need. He proposed instead that when the body encounters a new invader, it scans its 'catalogue' of antibodies and selects the correct one to deploy for the task of defeating it. This was the first of three groundbreaking theories for which Jerne received a share of the 1984 Nobel Prize in Physiology or Medicine. In this case, his theory was further refined by another Laureate, the Australian immunologist Macfarlane Burnet. Burnet's 'clonal selection' theory was published in 1957, and since then experiments have proved his premise to be correct. The theory stated the following: that there is a special class of white blood cells called B lymphocytes, and each lymphocyte is responsible for creating a specific antibody – or to use Ehrlich's analogy, a single ‘key’ – that recognizes and then binds to one particular antigen 'lock'. Whenever an antigen is encountered, the B lymphocyte with the appropriate antibody is reproduced an enormous number of times, to create enough of the appropriate antibodies with which to mount a defence. Jerne's and Burnet's theories explained where antibodies come from; however, the questions still remained: What exactly are antibodies? And just how are they able to target any number of different antigens? Early studies had shown that antibodies were essentially large protein molecules, but at that time they appeared to be far too large and far too unmanageable to analyse in any detail. Piecing together a picture of antibodies required the efforts of two scientists, each of whom hailed from opposite sides of the Atlantic. The British biochemist Rodney Porter, and the American physician Gerald Edelman, came up independently with the solution to this challenge: to use chemical substances to break antibodies down into smaller, more manageable pieces, and then to use sequencing techniques to decipher their protein codes. Their respective methods of breaking up the large molecules differed – but this had the advantage of providing two different perspectives of the antibody structure, which were later combined to form an even more definitive view. Together, Edelman and Porter received the 1972 Nobel Prize in Physiology or Medicine for revealing the structure of antibodies. Antibodies are composed of two long, heavy protein chains and two shorter, lighter protein chains, which combine to form three sections that make up a molecule shaped like the letter Y. At both points at the top of the 'Y', a light chain is paired with a heavy chain to form a unique binding site, which varies from one antibody to the next – in other words, to form Ehrlich's 'key'. 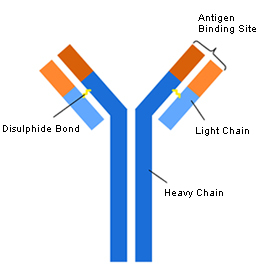 The third section – the stem of the Y – links the two heavy chains together to form a region that is common to all antibodies, and which binds complement and the other key antibody components required to mount a successful defence. This simplified diagram of an antibody shows how it is made up of four protein chains – two longer, heavy chains and two shorter, light chains – that join to form a 'Y' shaped molecule. The majority of each heavy and light chain is the same in all antibodies, and for this reason it is called the constant region (dark blue and light blue). But a small portion of each heavy and light chain differs from one antibody to the next, and it is these variable regions that combine to form the unique antigen-binding site for each antibody (dark orange and light orange). Identifying both variable and common regions within the same molecule explained how an almost identical-looking set of antibodies can specifically target any one of an almost infinite range of foreign agents for destruction. Yet it was still hard to imagine how there could be enough genes in the body to create the millions and millions of antibody proteins required to see off any and all potential threats. The Japanese scientist Susumu Tonegawa received the 1987 Nobel Prize in Physiology or Medicine for revealing the clever way in which a relatively small number of genes could create so many possible antibodies. Working in the Basel Institute of Immunology in the 1970s (which at the time was headed by Nils Jerne), he found that individual antibodies are assembled on a biological ‘production line’ from several genes. Each gene that encodes the heavy and light protein chain components are unlike regular, single genes; they are instead made up of many units, like a string of pearls. To create an antibody, one unit or 'pearl' from each component gene is selected randomly and stuck together to form the finished product. As a result of this selection and assembly process, millions of possible combinations can be produced. While Tonegawa was carrying out his pioneering work, Georges Köhler at the University of Freiburg, Germany, and César Milstein at the Laboratory of Molecular Biology in Cambridge, UK, were each trying to understand the differences between individual antibodies at the molecular level. Each researcher tried, and struggled, to find ways of tweaking cell lines grown in the laboratory to produce useful amounts of any one antibody reliably. But after they combined their efforts at Milstein’s workplace, they managed to create one of the most important techniques biomedical researchers have at their disposal today. Köhler and Milstein shared the 1984 Nobel Prize in Physiology or Medicine for their brainwave. They injected a mouse with a specific antigen, extracted the antibody-producing B lymphocytes from its spleen, and then fused these cells with a type of cancer cell that grows and multiplies forever. The hybrid cell that resulted from this fusion could both continuously synthesize antibodies and live indefinitely. And as Macfarlane Burnet said, a single B lymphocyte is responsible for creating only one kind of antibody. So by fishing out the correct B lymphocyte that produced the antibody against the injected antigen, Köhler and Milstein had in effect found a way of creating that specific antibody forever. Thanks to this cell-fusing method, scientists could now create any single (so-called 'monoclonal') antibody that would be specific to their antigen of choice – whenever, wherever and whatever they required. If you have ever had a blood test, or been tested for a viral or bacterial disease, the chances are that you have a lot to thank Köhler and Milstein for. 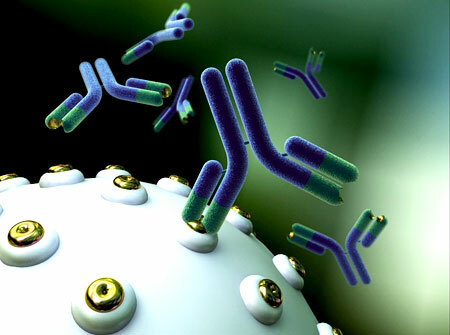 Because of their remarkable specificity, these pure monoclonal antibodies have been used to create a wealth of diagnostic tools, which are far more accurate and reliable than previous tests. Scientists have also started to engineer monoclonal antibody treatments that can tackle diseases such as cancers and rheumatoid arthritis. These treatments work by making certain dangerous cells more visible to the immune system, or by carrying potent toxins with them into cells, or by blocking any harmful chemical signals that could damage healthy cells. A representation of monoclonal antibodies (Y-shaped molecules) binding to its target antigen (gold rings) on a cell surface. Georges Köhler and César Milstein’s revolutionary technique has allowed scientists to create unlimited amounts of a single, specific type of antibody. Image kindly provided by Anna Tanczos, Wellcome Images. The more scientists discovered about antibodies, the more they began to realize that they still lacked a complete picture of the immune system's workings. For instance, in his complement experiments, Jules Bordet had seen that injecting blood from rabbits into guinea pigs provoked the same kind of hostile immune reaction that normally greeted a pathogen. Experiments by other researchers showed that people with severe burns receiving skin grafts almost invariably rejected these transplants. It was as if the body somehow knew that these cells and tissues belong to someone or something else. On reflection, this makes a great deal of sense. Any system responsible for recognizing and destroying foreign agents must also have a way of not attacking its own cells and tissues. But how could the immune system possibly recognize the cellular components of its own host? Like the story of antibodies, understanding this biological self-detection mechanism can be traced through several Nobel Prizes. In the early 1950s, Macfarlane Burnet was fascinated by curious observations that other scientists had made regarding the immune system of very young animals, and they inspired him to come up with a groundbreaking theory to explain how these defences are shaped. Burnet was especially taken with a discovery by the American geneticist Ray Owen, who found that cattle twins, whether genetically identical or not, carry an additional set of red blood cells, which they acquired from each other because they shared a placenta in the womb. Based on these observations, Burnet proposed that organisms could not possibly be pre-programmed to recognize their own cells. Instead, he stated that there must be a learning process as animals develop in the womb. During this time, the immune system is exposed to some form of ‘self’ molecules on cells, and so it gradually 'learns' which cells belong to its host. If his theory was true, Burnet boldly predicted that exposing a developing embryo to tissues from another animal would trick that organism into 'remembering' them as being part of itself. In other words, if the body encountered these foreign tissues again after birth, it would not reject them. As it happens, the British scientist Peter Medawar and his colleagues Rupert Billingham and Leslie Brent were carrying out the key experiments that would prove Burnet’s prediction to be correct. Medawar was fascinated by the processes behind skin-graft rejection, having worked in a hospital burns unit in the United Kingdom during the Second World War, and he had developed a method for timing skin-graft rejections precisely. Unaware of Owen’s findings in cattle, he was confident that the fate of skin grafts could be a foolproof test for distinguishing genetically identical and non-identical cattle twins. But to his great surprise when he put his theory to the test, all the skin grafts in his trial were accepted, whether they were carried out on identical or non-identical cattle twins. In trying to understand what was so special about cattle twins, Medawar came across Owen's findings and Burnet’s theory, and he thought that skin-graft experiments could put Burnet’s bold prediction to the test. Through a carefully planned series of experiments, Medawar and his colleagues showed that mice embryos that received cells from a completely different strain of mouse could happily tolerate skin and tissue grafts from that particular donor strain later on in life, but they would reject any cells and tissues they received from any other strain. Burnet and Medawar were awarded the 1960 Nobel Prize in Physiology or Medicine for discovering this process, through which the immune system learns not to attack its host's cells – otherwise known as immunological tolerance. Medawar’s demonstration that tolerance could be acquired in mice provided a massive boost to scientists and physicians seeking to develop more successful ways of transplanting tissues between humans. Although Medawar's procedures in mice could not be applied to humans, the idea that it was possible to subvert the factors that provoke transplant rejection set the stage for a whole new field of transplantation biology. Deciphering what formed this 'self-awareness' signal in cells was a far from straightforward process. However, the first clues came from a completely different set of transplant experiments that were carried out in the 1940s. The American geneticist George Snell was searching for the genetic factors that cause rejection of tumour transplantations in mice. At that time, the list of suspects had been narrowed to a few unidentified genes lying at different locations on mouse chromosomes, and Snell spent years carefully creating special strains of mice that would allow him to examine the effect of each location on transplant rejection in turn. Snell’s dedication was not helped by a disastrous fire at his laboratory, which destroyed many months of painstaking work. But his endeavours were eventually rewarded with the discovery that one genetic location stood out as providing the strongest barrier to transplantation. And as it happened, this site accommodated a gene that encoded an immune-stimulating protein called H-2, which had already been discovered by the British scientist Peter Gorer. Upon closer inspection, this region of DNA contained a surprisingly large number of genes linked tightly together, which earned it the name 'major histocompatibility complex', or MHC for short – and its resulting protein products were called 'histocompatibility antigens'. It took another decade for the first human histocompatibility antigen to be discovered, and to do so required a patient with an unusual blood reaction and a highly perceptive French immunologist called Jean Dausset. Dangerous blood transfusions had become a thing of the past for decades, thanks to the Austrian biologist Karl Landsteiner's discovery of human blood groups (for which he was awarded the 1930 Nobel Prize in Physiology or Medicine). But the patient standing before Dausset had an altogether different and perplexing problem, having suffered an adverse reaction after receiving several transfusions of compatible blood. Landsteiner had discovered blood groups by observing adverse responses in red blood cells, but Dausset discovered that this patient’s reaction was actually being caused by antibodies targeting white blood cells. To be more specific, the antibodies had been launched against white blood cells belonging to the donor, and not to the patient. And Dausset subsequently observed that these antibodies triggered a similar reaction in half the samples of white blood cells taken from other people. Dausset called the factor responsible 'MAC'’ – which stood for the initials of the first donors whose blood he used for this research. MAC turned out to be the first of a series of human leukocyte antigens, or HLAs, to be identified. In time, it became clear that these HLAs are, in fact, the human version of the major histocompatibility complex. The HLA genes are so variable and yet so specific for each individual that they form a kind of 'fingerprint' at the cellular level. An unprecedented collaboration between scientists worldwide led to the understanding that this represented a new way of identifying genetic variation between people. This collaboration also showed how human tissue transplants were more likely to succeed if the HLA fingerprint of a donor was similar to that of the recipient. This HLA typing system is still an essential tool for selecting compatible donors for tissue transplants today, and perhaps more importantly, HLA typing is also used to select unrelated volunteer donors for stem-cell transplantation. All of these breakthroughs threw up an interesting question. The main biological function of the MHC and HLA systems could not be to trigger transplant rejection, as the ability to perform transplant procedures had only become possible in modern times through advances in medicine. So why does the MHC or HLA system exist? The everyday role of the MHC began to become clear in the 1970s. The Venezuelan immunologist Baruj Benacerraf provided the first indication that immune reactions are controlled by the MHC genes. While investigating immune responses Benacerraf discovered, much to his surprise, that different strains of guinea-pigs launched different levels of attack towards the same foreign antigen. He traced this effect to what he termed 'immune response genes', and over the years many more of these genes have been discovered, all of them members of a previously undiscovered cluster of genes lying within the MHC. Although their discoveries were decades apart, Benacerraf, Dausset and Snell all shared the 1980 Nobel Prize in Physiology or Medicine. Around the time that Benacerraf published his findings on the immune response gene, two researchers found themselves working together in Canberra, Australia, on how the immune system deals with cells infected by viruses – and in the process they uncovered the main function of the MHC. Peter Doherty and Rolf Zinkernagel began working together quite by chance, in part because a lack of lab space forced them together, and in part because of their common love of opera. Another common interest was the T lymphocyte, a different sort of immune cell from the antibody-producing B lymphocytes. T lymphocytes seek out and destroy viruses after they have entered and infected cells; and in order to do this effectively, they must have a way of distinguishing between infected and normal cells. Doherty and Zinkernagel were surprised to find that the T lymphocytes they were studying could only wipe out virus-infected cells belonging to the same strain of mice, and not cells from any other strain. They realized that in order for T lymphocytes to kill infected cells, these cells must be able to recognize and respond to two signals simultaneously. One is a tell-tale antigen that belongs to the virus, the other a MHC protein that informs the immune system that the infected cell belongs to its host. Further investigations revealed how this works in greater detail. The antigen from the virus attaches itself to the MHC protein and distorts it, and it is this altered ‘self’ protein that warns the T lymphocytes that a cell is infected. 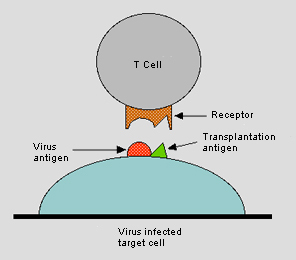 Peter Doherty and Rolf Zinkernagel discovered that in order to kill a virus-infected cell, T cells (or T lymphocytes) must recognize both an antigen belonging to the virus and a histocompatibility antigen (or transplantation antigen) molecule, which signals that the infected cell belongs to the host. This figure originally accompanied the announcement of Doherty's and Zinkernagel’s 1996 Nobel Prize in Physiology and Medicine, and is itself a modification of the original figure that Zinkernagel and Doherty used to illustrate their findings (Zinkernagel R.M., Doherty P.C. Nature 251: 547–548 (1974)). In other words, Doherty and Zinkernagel showed that the MHC proteins are there to help spot whether the body's cells have been infected by a virus – or indeed have suffered any other damage. Speak to any immunologists who were working within this field at that time, and they will tell you how astonishing these findings were. The common assumption was that it was only viruses or bacteria that could trigger an immune response; nobody had really thought that the body's own cells could do the same. Almost 200 years after Jenner made his pioneering discoveries with smallpox, and around 100 years since the great cells-versus-blood debate about immunity was initiated between Metchnikov and Ehrlich, Doherty and Zinkernagel received the Nobel Prize for Physiology or Medicine in 1996, for revealing the secrets of what immunologists now call the 'cell-mediated immune defence system'. As we can see, the immune system provides each of us with a remarkably sophisticated protection network. However, every so often this defence mechanism can turn against us. Anaphylaxis, or anaphylactic shock, is the name given to a sudden, sometimes fatal allergic reaction involving the whole body, typically to bee stings or even seemingly harmless foodstuffs like peanuts. Charles Richet was awarded the 1913 Nobel Prize in Physiology or Medicine for discovering how the immune system can over-react in such a destructive way. Richet was a true Renaissance man – both a playwright and a physiologist. His lifelong love of learning encompassed Latin, sailing, politics, literature and the arts. His studies on anaphylaxis had an unusual startpoint, and were inspired by a momentous sea voyage in 1900. On board this trip were two other scientists, Paul Portier, a comparative physiologist, and Albert Grimaldi, who was an avowed oceanographer, but who was perhaps better known as being the son of the Prince of Monaco. The Prince suggested to Richet that someone ought to study the poisonous sting of the Portuguese Man o' War jellyfish, and as a result, Richet began experimenting with the poisons of sea anemones. Richet discovered that dogs that had been unharmed by an initial injection of poison always went into shock and died quickly after receiving a much weaker dose some days later. Rather than increasing immunity to a particular poison, the initial dose seemed to make animals highly sensitized to that poison. Richet developed the biological rules of what he called anaphylaxis (from the Greek words ana, meaning "against" and phylaxis, meaning "protection"); and this allowed the creation of medical warning systems that could identify patients susceptible to such potentially fatal hypersensitivity. In some cases, the body literally turns on itself, mistakenly creating antibodies and T lymphocytes that attack its own cells and tissues. This misguided destruction leads to autoimmune diseases; for instance, T lymphocytes cells that destroy insulin-producing cells in the pancreas cause Type 1 diabetes, while other attacks on the body's tissues lead to the painful joint inflammation experienced by those suffering rheumatoid arthritis. The term used to describe this – autoimmunity – had been coined by Paul Ehrlich over a century ago, although he had originally given it a much more terrifying name: horror autotoxicus (literally, 'the horror of self-toxicity'). No one knows exactly what causes autoimmune diseases, but it’s likely to involve a complex collection of factors. Baruj Benacerraf's discovery of the immune response genes showed that the major histocompatibility complex (MHC) plays an important role. A high proportion of human patients with autoimmune diseases carry particular genetic variants of the histocompatibility antigens; for instance, scientists know that many people with rheumatoid arthritis display a particular type of the 'self' antigen called HLA-DR4. By understanding the biological triggers of autoimmune diseases better, scientists today hope to discover ways of suppressing the parts of the immune system that become overactive. However, there is still much to learn. The Nobel Prizes in Physiology or Medicine have celebrated an extraordinary period of more than a century, during which many of the mysteries of the immune system have been revealed. The impact of this research upon humankind has been enormous – most notably in allowing the creation of vaccines that now prevent many diseases, saving billions of lives worldwide. Today, scientists have a greatly advanced understanding of the biological means by which the body senses invasion, triggers its innate immune responses and sets up its antigen-specific adaptive immunity. All of this continues to provide invaluable insight into infectious diseases, allergies, autoimmune conditions, and the rejection-risk associated with transplantation. Of course, there is still much that needs to be done. Effective vaccines are urgently needed to treat drug-resistant forms of pathogens that cause diseases like malaria and tuberculosis, and to prevent new threats, such as the H5N1 subtype of Avian influenza. Scientists are also exploring ways in which our defences break down or are overwhelmed by cancers and human immunodeficiency virus (HIV infection). They are also searching for ways of making patients tolerate transplanted organs and tissues, without the need for continuous and risky treatment with immune-suppressing drugs. Finding the answers to these and to other questions will require further breakthroughs; but the century ahead promises to be an auspicious one for revealing more secrets about the defence mechanisms that make up the immune system. First published 6 September 2010. The text is not updated since 2010. This article is an element of the multimedia production "Immune Responses". "Immune Responses" is a part of the AstraZeneca Nobel Medicine Initiative.